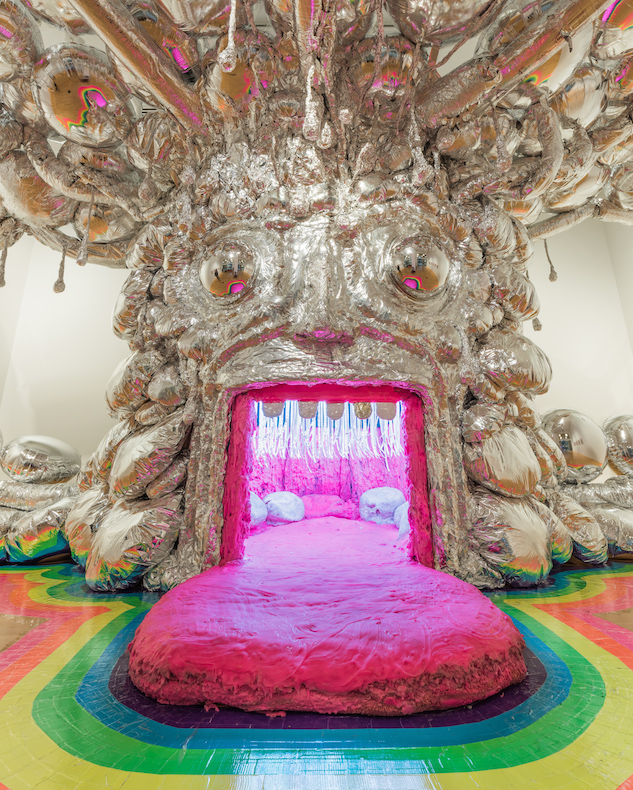 2017—The Center for Contemporary Art & Culture at Pacific Northwest College of Art (PNCA) presents King’s Mouth, an installation by Wayne Coyne, November 2, 2017 through January 6, 2018 in the 511 Gallery. In addition to being frontman for The Flaming Lips, whose concerts are elaborate, visually stunning, communal spectacles, Coyne has designed album cover art for the band, drawn comic books, released new music on flash drives embedded in gummy skulls, directed a science fiction Christmas film, and opened a funhouse-style arts venue (The Womb) in his hometown of Oklahoma City. In 2015, Coyne made his exhibition debut at Baltimore’s American Visionary Art Museum (AVAM), where King’s Mouth was one of the most popular attractions in the museum’s history. A surreal and immersive installation, King’s Mouth is an enormous metallic head beckoning visitors to crawl inside its foam mouth, kick back, and experience a cascading LED lightshow synchronized to Flaming Lips music. Baltimore magazine named King’s Mouth one of the year’s best artworks, likening it to a cross between “a bean bag, the iconic Rolling Stones tongue, and an acid trip.” The installation is accompanied by a series of works on paper that illustrate a fantastic creation myth. These pieces—done in hotel rooms after shows, between takes in recording studios, and at the kitchen table at home—combine original drawings with images clipped from magazines, glitter glue and stickers from Wal-Mart, and cut-up pieces of Flaming Lips record sleeves.